Carved and constructed oak bench. Commissioned by the Canal & River Trust. Sited by the Upper Arm of canal at Foxton Locks for use by children on pond-dipping visits to the nature reserve. I am well practised at combining practical functionality with playful sculptural forms. 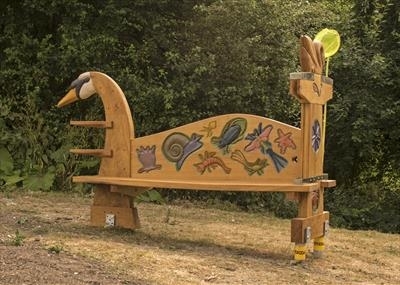 This bench is designed so that children can prop their pond dipping nets in the storage slots, place their specimen trays on the shelves, and study the carved relief examples of water-life they might find in the canal. I used some of visual reference I had gathered when I made the Three Post Bench on the Gyosei Art Trail by the canal in Milton Keynes, as both benches are sited by water.